A garden feature of a vertical post or a pillar supporting cross-beams and sturdy open lattice that forms a shaded walkway, passageway or sitting area in your backyard is known as a pergola. The word originates from the Late Latin pergola which meant a projecting eave. It can also be an extension of a building or may serve as protection for an open terrace or may link pavilions. 18th and 19th centuries featured pergolas in the garden. Beautiful pergolas on brick and stone pillars with cross beams were a feature in the gardens designed by sir Edwin Lutyens and Gertrude Jekyll in the late 19th and early 20th centuries which epitomized their trademark of firm structures planted luxuriantly. However, modern pergola designs are made up of wood, fiberglass, aluminum, steel. Brick or stone pillars are not in use nowadays. Different pergola designs and plans are available nowadays. Each offers a different aesthetic and various different advantages. These are affordable ways to make your backyard look elegant and beautiful. Different types of pergolas are as follows. Pergolas made from steel are long lasting, strong and durable. They are very affordable and stylish and they offer a very different look. If you want to give your pergolas a very sleek and modern look, then you need to opt for sail pergolas which by incorporating a stretched sail suspended between posts as the main roofing structure provide shade and are far cheaper and easier to build than other pergolas. These are angled roof pergolas which allow good water runoff and a wide range of design options. Open top pergolas without roof cladding offer a way to improve your outdoor areas look and channels air flow. Building a pergola will surely give your backyard the extra flare to boost its sophistication. These garden features provide breathable covers for any backyard space or walkway. They not only provide a fashionable source of shade to your backyard space or walkway, but also give your garden a shelter that can make a statement. There are different types of pergola materials as well as designs available nowadays. There are wooden pergolas, which offer a natural and elegant look to your backyard. If you are on the lookout for more modern and sleek approach, then you need to opt for metal pergolas. These materials provide plenty of flexibility and offer a variety of styles. It is durable and weather resistance as well. These pergolas are quite easy to install in your garden because they are often available in penalized kits which don't require any cutting. The metal option includes steel and aluminum. Nowadays, steel pergolas are gaining a worldwide popularity because of their sturdy nature and easy to install features. Aluminum pergolas also provide an easy installation procedure and are also a financially-friendly option. They also require very little maintenance. With their unique designs to separate them from other outdoor structures, pergolas are generally made up of four posts that support a roof made up of beams and slats, in pergola designs there are no walls, which leaves all four sides completely open and gives unobstructed view of your yard and let the cool breeze flow freely through the structure. The roof by blocking the majority of sun’s harsh rays gives you a shady yet open space. Enjoy relaxing in your garden. 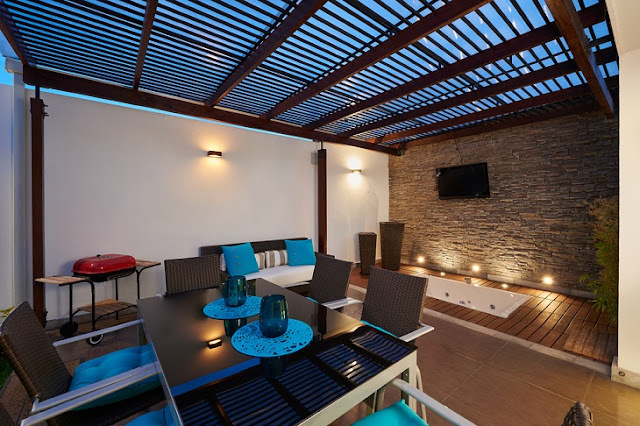 Pergolas are a super spot for all kinds of activities, from dining with family to sitting in the hot tub after a busy day. Mostly, they are square or rectangular but these days the other shapes are available as well.